UPDATE: Now for Windows 8 and Windows 10 too! 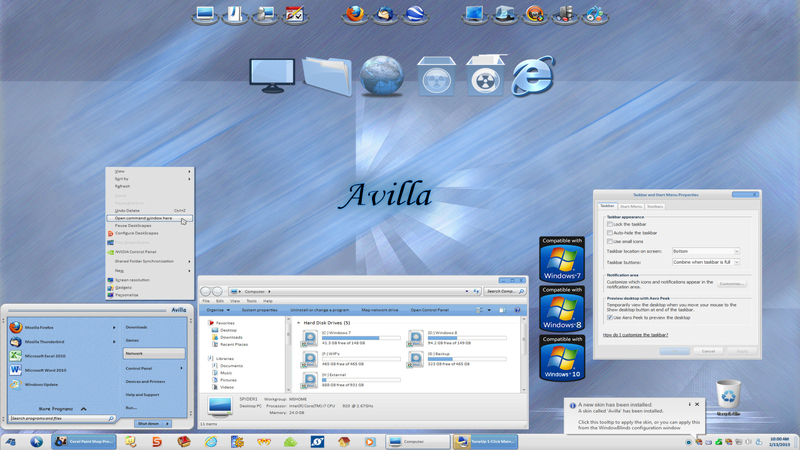 Just finished updating Avilla, now for Windows 7, 8 and 10!! I really like how this one turned out, very pleasing and soothing on the eyes. Comes complete with desktop wallpaper shown in both standard and widescreen formats, CursorXP/FX set, and icons for use in docks in 256 x 256 PNG format as well as .ICO's. Because extras are included this will download as a .ZIP file and you will need to extract items separately from within it to install. I hope you truly enjoy Avilla! good job, I like it. firefox users, enable titlebar so it skins right.